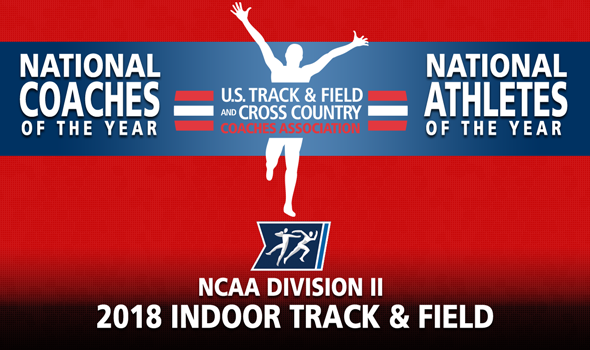 These awards were voted on by USTFCCCA member coaches based on performances both at this past weekend’s NCAA Division II Indoor Track & Field Championships as well as performances throughout the entire regular season. Pringle had a historic performance in Pittsburg, Kansas, last weekend, posting the NCAA Division II all-time, all-conditions 400 time of 45.93 for a national title. The junior from Cincinnati was also responsible for eight points in the 200 (20.96) and another two points in the 4×400 (3:10.44), bringing his point total to 20. During the regular season, Pringle owned the top NCAA Division II time in the 400 at 46.42, an event in which he also won a conference title. Pringle becomes the second athlete from Ashland to pick up NCAA Division II Men’s Indoor Track Athlete of the Year honors, joining Drew Windle (2013-14). What didn’t Konieczek accomplish this year for the Mountaineers? The redshirt-junior from Zbaszyn, Poland, posted a whopping 22.5 points for her program thanks to titles in the mile (4:48.33) and the 3000 (9:29.39) in addition to anchoring the distance medley relay squad that finished with a time of 11:19.98. Konieczek also captured RMAC Championships in the 3000 and mile while placing third in the 800. Her 3000 time of 9:22.52 set at the Husky Classic was the top mark in NCAA Division II this season. Konieczek becomes the first woman to capture NCAA Division II Women’s Indoor Track Athlete of the Year honors from Western State. Edie added to his indoor long jump national title collection by picking up his second victory in three years this past weekend in Pittsburg, Kansas. The senior from Kingston, Jamaica, posted a mark of 7.76m (25-5½) to take home the title in addition to recording a runner-up finish in the triple jump at 15.55m (51-0¼). Edie scored all 18 points for the Blue Tigers at the championship meet. Edie claimed the long jump title at the MIAA Indoor Track & Field Championships while also finishing second in the triple jump. He was one of only six athletes to hit an NCAA Division II Automatic Qualifying Mark in the triple jump on the season. Edie is the first Lincoln (Mo.) male athlete to win an NCAA Division II Indoor Track or Field Athlete of the Year award. Affessi played a major role in leading the Lady Buffs to its first-ever NCAA Division II indoor title. The sophomore from Geneva, Switzerland, took home the triple jump title with a mark of 13.09 (42-11½) and finished fourth in the long jump with a leap of 6.09m (19-11¾). During the regular season, Affessi entered the NCAA Division II indoor collegiate record book as the third-best triple jumper of all-time with a mark of 13.20m (43-3¾) as well as becoming the eighth-best long jumper with a mark of 6.30m (20-8). Both marks led the NCAA Division II this year. Affessi became the second-consecutive Lady Buff to win the award, joining 2017 winner and teammate Rellie Kaputin. Jewett had as good a weekend as any NCAA Division II coach has ever had, winning the NCAA Division II Men’s Indoor Track & Field Championship on his home turf. In his 30th year at Pittsburg State, Jewett led the Gorillas to its first indoor national title with 49 points after claiming the MIAA Championship a few weekends prior. His program posted one national champion and seven conference champions in addition to hitting 20 NCAA Division II Provisional Marks and two NCAA Division II Automatic Qualifying Marks on the season. Of the nine men he coached that qualified for the NCAA Division II Indoor Championships, six of them were ranked in the top-five of their respective events on the Descending Order List. This marks Jewett’s second NCAA Division II Indoor Coach of the Year Award, although it is his first Men’s Coach of the Year honor after winning the women’s award in 1995. It’s going to be hard for Stewart to top his first year at West Texas A&M. First, he led his program to its first indoor national title before picking up the program’s first-ever NCAA Division II National Coach of the Year Award. Stewart’s jumpers accounted for 31 of the team’s 53 points with national titles coming in the long jump and triple jump. The Lady Buffs also captured the Lone Star Championship on the year where individuals claimed six event titles. His women had eight top-10 Descending Order List marks on the season, including Fatim Affessi’s NCAA Division II leading marks in the long jump and triple jump and Rellie Kaputin’s second-best marks in the same two events. Rutledge played a major role in Pittsburg State’s run towards a national title this season. In his sixth year coaching the high jump, pole vault and heptathlon, his athletes accounted for 21 of the team’s 49 points at the national meet. At the MIAA Championships, his athletes notched a total of 51.5 points, helping the Gorillas bring home the title. During the regular season, his athletes posted four top-10 NCAA Division II Descending Order List marks in their respective events. Rutledge becomes the first Pittsburg State coached to be named NCAA Division II Indoor Men’s Assistant Coach of the Year in program history. The Mountaineers posted a runner-up finish at the NCAA Division II Indoor Track & Field Championships, and much of that can be attributed to Michel and her pupils. Thirty-nine of the team’s 40 points came in distance events, including a whopping 16 in the 3000, where sisters Alicja and Aneta Konieczek finished first and third, respectively. Her athletes also accounted the distance medley relay title. This is Michel’s first NCAA Division II Women’s Assistant Coach of the Year Award, but she has picked up the Men’s Assistant Coach of the Year Award (2012) as well as the Men’s Cross Country Coach of the Year (2007 and 2011).